A Royal Air Force C17 transport aircraft has arrived at Gao airfield in Mali for the first time. The flight was to deliver supplies to the RAF Chinook Detachment currently deployed supporting French operations there. 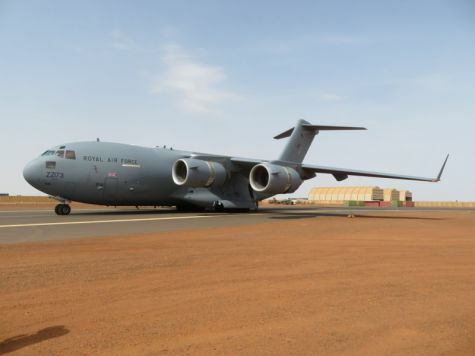 “Flying directly into Gao significantly shortens the logistics chain, which until now has relied on onward movements of freight from Niamey Air base in Niger. Being able to fly to Gao has made an immense difference to supporting operations,” said Flying Officer Matt Nowicki, The Detachments Logistics Officer. "This is no mean feat and the support from the French has been outstanding unloading the vast amount of freight onto a makeshift operating area located close to the UK detachment,” said Wing Commander Matt Roberts, The RAF Detachment Commander.